It's that time of year to clean up the ball park and get it ready for months of games. That's what we did this morning. Meg had practice at 8 and then the clean up started at 10. We showed up to help out. I never got a picture of Meg because she was off with team mates working, or talking. Mickey, the reds, and I raked and bagged leaves. A couple of Mat's friends from school were there. That helped her enjoy the work more. It was so windy. 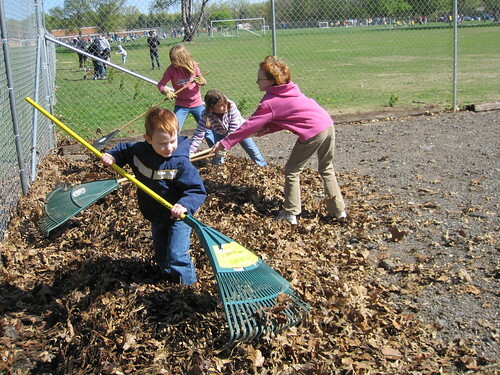 As soon as you had a nice pile of leaves they would start blowing away. Of course it was the opposite direction of where the bag was. At least the sun was out.